If you are looking for a spacious, well-built modern 4 berth touring caravan, with the convenience of a fixed island double bed, this caravan will tick all of those boxes and more. 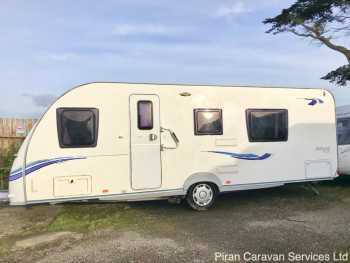 Featuring a spacious lounge which can be converted into a double bed, a centrally positioned kitchen and washroom with a separate shower, and a private bedroom with an island double bed that can be accessed from both sides, this continental tourer has style and practicality to match. No more climbing over your partner to use the bathroom at night! 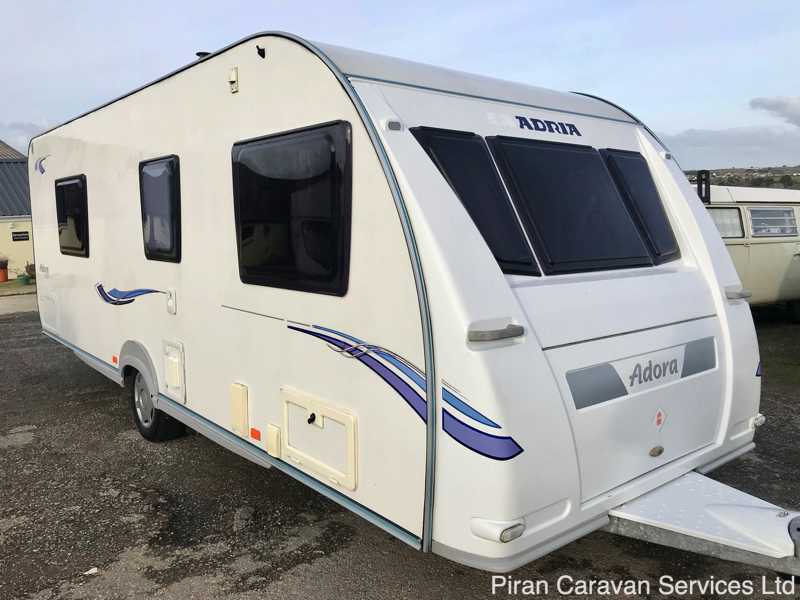 This Adria Adora will suit a couple who want the space and convenience of a tourer in which the bed can be left made up during the daytime. It will also suit smaller families with children who can use the lounge seats as singles. This Adria Adora 612 DP is a lovely example of a large 4 berth continental touring caravan, on a single axle, with lots of extras. Well-looked after and carefully maintained by its current owner, it will be cleaned inside and out by us and serviced and damp-checked by an independent specialist caravan workshop prior to sale. 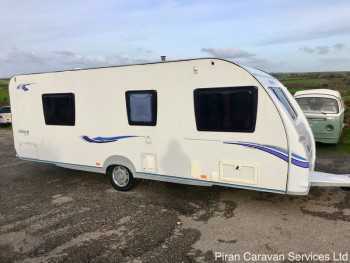 Usually, a caravan of this size would often be seen on a twin axle, adding more weight, but this Adria is built on a single axle, for manoeuvrability, with a Continental-style A-frame, which is longer than usual U.K. caravans, and comes with an Al-Ko AKS stabilising hitch for towing ease. The single-axle Alko chassis makes the Adora relatively easy to manoeuvre on site and the exterior of the Adria features an easy-action handbrake and heavy duty corner steadies. 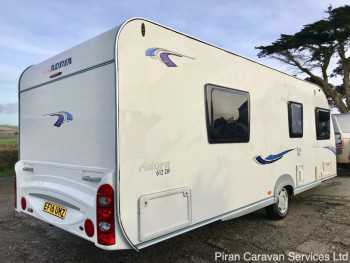 Continental caravans have a style all their own and this caravan has a gleaming white body-shell which is set off by attractive blue graphics. The body construction is polyester rather than aluminium and this makes for a very long lasting exterior. The front and rear panels are full height ABS and there is a large lift-up gas/storage locker at the front. A two-piece exterior door leads to a continental style interior with a comfortable, functional and practical feel, like most continental caravans, and the design of the fixtures and fittings gives the caravan a hardwearing aspect...a plus point for a caravan which is perfect for couples and families alike! At the front, by day, the U-shaped lounge is flooded with light from the large one-piece front window, and once the sun sets there are plenty of options for lighting, which is all energy saving LED, including front corner lights, adjustable spotlights or ceiling lights. There's also a clock and a CD/ radio unit with speakers and a useful powerpoint in the lounge. The lounge seating is upholstered in 'Opulence' design textile and is complemented by matching curtains. There is a folding dining table which allows for family mealtimes and the lounge seating converts into a double bed when the table is collapsed. There are plenty of overhead aircraft-style lockers and all the furniture in the caravan is finished in an attractive 'Ohio Kirsch' wood veneer. Moving back through the Adria Adora, for a continental caravan, the kitchen is extremely well-appointed and features a three-burner hob which complements the 97-litre fridge, and the grill is separate from the oven. Adria also supplies a glass lid for the sink as well as for the hob, maximising surface workspace. There are overhead cupboards, finished in the same attractive veneer as in the rest of the caravan. Along with its generous storage capacity, the Adria kitchen is bright and airy, thanks to a large opening sunroof. All this, plus the high level of equipment for a continental caravan, makes the Adora's kitchen really stand out. Opposite the kitchen is the washroom, which is also well furnished and features a swivelling toilet with electric flush, a washbasin and vanity unit and a separate shower with a chrome mixer tap. The washroom is spacious and extremely practical, either for couples or small families. The fact that it is centrally positioned allows occupants sleeping at either end to access the washroom without disturbing each other. At the rear of the Adria, there is a large bedroom, which uses the overhead space especially well, having several overhead lockers for clothes and small shelves that are perfect for books, a glass of water or a mobile phone. A mini sunroof makes this area light and airy as well as functional. The fixed island double bed has a luxury mattress and lifts up on gas struts to access the storage space underneath. The trump card with the bedroom layout is that the double bed is an island bed, which means that occupants can get in and out of either side, without one climbing over the other. Perfect for people who don't like their sleep disturbed! In summary, this Adria 612 DP 4 berth tourer is the perfect caravan for a couple wanting a very spacious caravan or a family with children, due to its flexible layout which doesn't seem to compromise on beds or living space. It comes with some essential extras and will be cleaned inside and out by us as well as serviced and damp-checked by an independent caravan specialist, providing real peace of mind for a new owner. All it will need is a new owner to take it away and use it to discover the joys of family caravanning holidays. Please give us a call now to find out more. 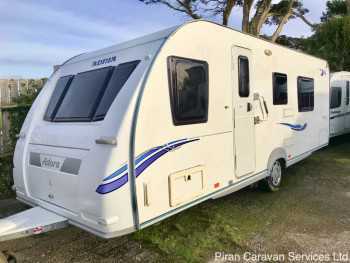 This caravan has a place within our otherwise full CaSSOA gold caravan storage facility (subject to availability - please ask us). 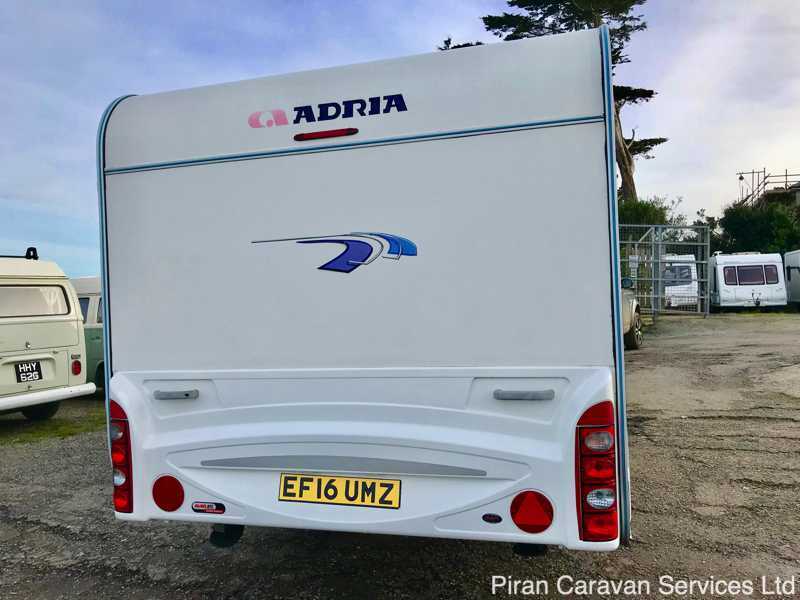 To view the Adria 2011 brochure click here. Please click to enlarge and browse images.